RenoServices.ca can find experienced, professional contractors and renovation experts in the Greater Toronto. We help you the right peopel for all your remodeling and home repair and management needs, quickly, professionally and on budget. To find the renovation expert, please use the following request form free of charge. Local contractors will provide you with a quotation shortly. Please selectN/A50 sq. ft.100 sq. ft.150 sq. ft.200 sq. ft.250 sq. ft.300 sq. ft.350 sq. ft.400 sq. ft.450 sq. ft.500 sq. ft.1,000 sq. ft.1,200 sq. ft.1,400 sq. ft.1,600 sq. ft.1,800 sq. ft.2,000 sq. ft.2,200 sq. ft.2,400 sq. ft.2,600 sq. ft.2,800 sq. ft.3,000 sq. ft.3,500 sq. ft.4,000 sq. ft.4,500 sq. ft.5,000 sq. ft.5,500 sq. ft.6,000 sq. ft.6,500 sq. ft.7,000 sq. ft.7,500 sq. ft.8,000 sq. ft.8,500 sq. ft.9,000 sq. ft.10,000 sq. ft.10,000+ sq. ft. Please enter the letters/numbers in the image above. Located in the heart of downtown Toronto, the Direct Energy Centre, Exhibition Place, is close to entertainment, shopping and hotels. Ample parking is available and transit is just a short walk away. People have always been drawn towards the water, seeking out the cool refreshment of lakes and beaches whenever the weather shows even a hint of sunshine, and the health benefits of fountains are well documented. But since it’s not always easy to get to the water, why not bring it right to you? 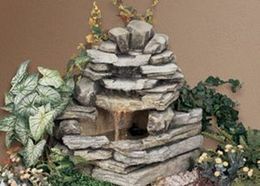 This Stonescape fountain from Sunterra is only one of the company’s many natural-looking options for your lawn or backyard, constructed to complement and blend in with your landscaping. The continual flow of water through the stones and the shadowy play of the beams in the pool at the bottom (the model comes with a pump and an accent light) make it a centerpiece for any outdoor environment. Just picture the sound of flowing water while you’re sitting outside enjoying the afternoon sun, and it’ll be hard to resist the allure of this small oasis. Visit the company’s website to discover all of their fountain options and find a dealer near you. Merkley Supply now offers in-lite outdoor lighting products. These low-voltage lights bring gardens, patios and balconies to life after dark. Integrated Lighting – These light fittings can be integrated into wood, concrete and natural stone to sit flush with the ground. Above-Ground Lighting – Solitary, above-ground light fixtures stand a few inches of feet above the ground and are housed in steel of stone pillars. Wall-Mounted Lighting – These lights can be placed directly onto outer walls or fences. Spot Lighting – Spot lighting lets you cast light on distinctive garden objects such as trees, shrubs or statues. 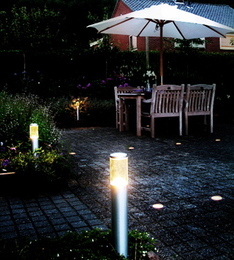 Light up your landscaping projects using in-lite’s plug-and-play lighting systems. On the “saving” side of the water conservation argument, dual-flush toilets can be found, those anomalies most often found in European bathrooms, but becoming more common on this side of the Atlantic. 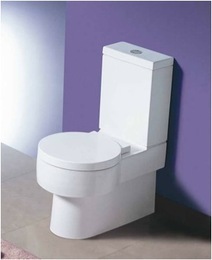 Australian company Caroma (which sells its wares worldwide) has designed a modernist version of a high efficiency toilet, complete with two buttons for flushing, in the Brisbane 270 Round Front Plus. This clean-lined amenity looks less like a toilet and more like an art accessory, giving you the perfect excuse to upgrade to both a sleeker design and a less wasteful lifestyle. Find more information at the company’s website. 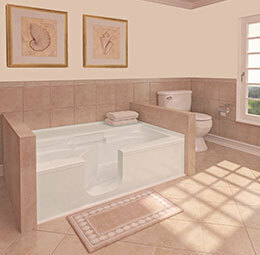 A regular-sized bathtub with a door, the Safety Bath So-Lo is attractive and fits comfortably into a home-like setting. The door allows barrier-free bathtub access, to allow bathing but can also be used as a shower. It allows for the addition of optional whirlpool and shower deck with heated seating. The Safety Bath So-Lo provides both a bathtub and shower, thus saving bathroom space and provides a safe bathing option. With a very low entry step and outward door swing, this model is the original walk-in bathtub.